Marriage equality in Iowa was approved by a unanimous decision of the Iowa State Supreme Court on April 3, 2009. Rallies were held across the state celebrating the decision. 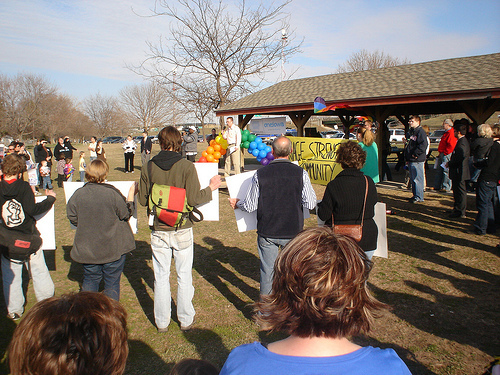 One such rally was held in Council Bluffs at Playland Park. At the beginning of the rally, people from Council Bluffs crossed the pedestrian bridge and escorted GLBT folks and their supporters from Nebraska to Iowa to be a part of the rally. The crossing of the “Equality Bridge” was highly symbolic. People brought rainbow flags and American flags to wave. Speakers, who included local elected officials, religious figures, gay rights supporters, attorneys and their allies, talked about the exciting events.